Five competitive research centers have been awarded to UCLA in the last two years. Dean Vijay K. Dhir is making his mark – again. Dr. Dhir is an internationally recognized leader in engineering education and research. A professor of mechanical and aerospace engineering, Dr. Dhir was named Dean of UCLA’s Henry Samueli School of Engineering and Applied Science in March 2003 after serving as interim dean for the previous year. Born in India, Dr. Dhir received his Bachelor of Science degree from Punjab Engineering College in Chandigarh, India, in 1965 and his Master of Technology degree from the Indian Institute of Technology in Kanpur in 1968. He came to the United States in 1969 to continue his university studies in mechanical engineering, receiving his Ph.D. from the University of Kentucky in 1972. In the late 1960s he worked for a short period in industry as an engineer. He joined the UCLA faculty in 1974, and for the past 30 years he has been a consultant for numerous leading organizations, including GE Corporation, Rockwell International, the Nuclear Regulatory Commission, and the Los Alamos and Brookhaven National Labs. 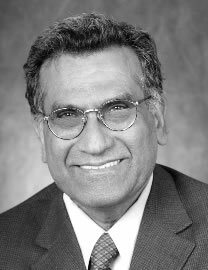 Dr. Dhir served as vice chair of the UCLA Department of Mechanical and Aerospace Engineering from 1988 to 1991, and was chair of that department from 1994 to 2000. From July 2001 to February 2002, he served as the school’s associate dean for academic and faculty issues. He has worked to make UCLA’s Engineering School a hub for interdisciplinary research. In the last two years, the School has won five competitive research centers from the federal government and private industry that will bring more than $100 million to Southern California in the next five years to spur research and development on emerging technologies. Dr. Dhir is the recipient of the American Society of Mechanical Engineers (ASME) Heat Transfer Memorial Award in the Science category and the Donald Q. Kern award from the American Institute of Chemical Engineers. He is a fellow of ASME and the American Nuclear Society. Dr. Dhir has been the senior technical editor for the American Society of Mechanical Engineers’ Journal of Heat Transfer since 2000. He previously served as the Journal’s associate editor. He is also a former assistant editor of Applied Mechanics Review, and is on the advisory boards of several other journals. Dr. Dhir leads the boiling heat transfer lab, which has conducted pioneering work in fundamental and applied sciences involving boiling, a process of heat removal. The lab is involved in the study of flow boiling, micro-gravity boiling, natural convection and electronic cooling. Since 1999 a team of researchers led by Dr. Dhir has been taking part in a NASA research program to examine the effects of boiling in space. More recently, Dr. Dhir partnered with UCLA electrical engineering professor Elliott Brown on an innovative method of removing high heat fluxes from power amplifier chips. Dr. Dhir and his wife, the former Komal Khanna, are the parents of two daughters, Vinita and Vashita.